Sunday — Finally ready to go, and the port engine wouldn’t start! Tim re-seated a fuse, and things worked. Mysterious…not clear if it is actually related to the fuse. But we got underway, and waved goodbye to Hallie as we left. 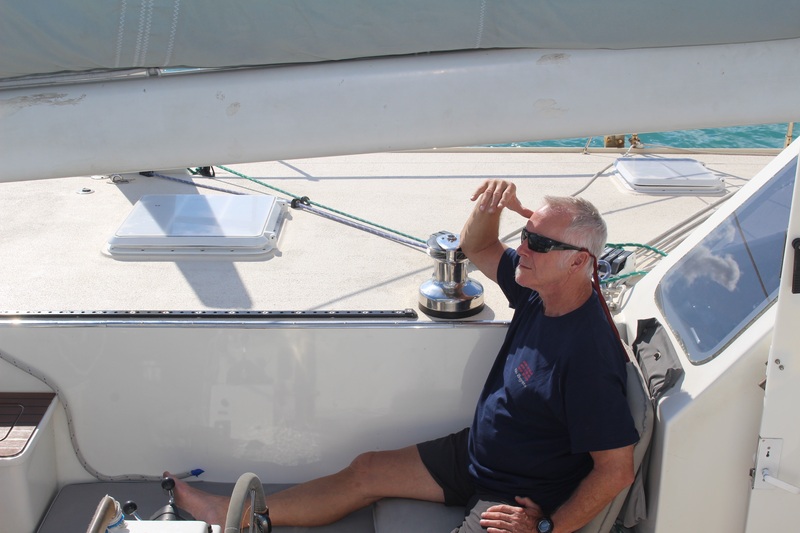 We had a pleasant day’s sail to Kennedy Sound, and anchored west of Shaw Island. Cooked steaks on the grill, watched the full moon rise. Delightful. Monday — Underway by 8am, had a beautiful short sail to White Haven Beach on Whitsunday Island, where Chapter Two and Tahawus had sailed the previous day. We anchored close to the beach, and Jesse and I swam ashore for a little walk. Tim made fancy baked eggs for brunch. Then underway again and headed for Butterfly Bay at the north end of the island. There are moorings in and around the bay, but all were taken, and the water was too deep for easy anchoring. 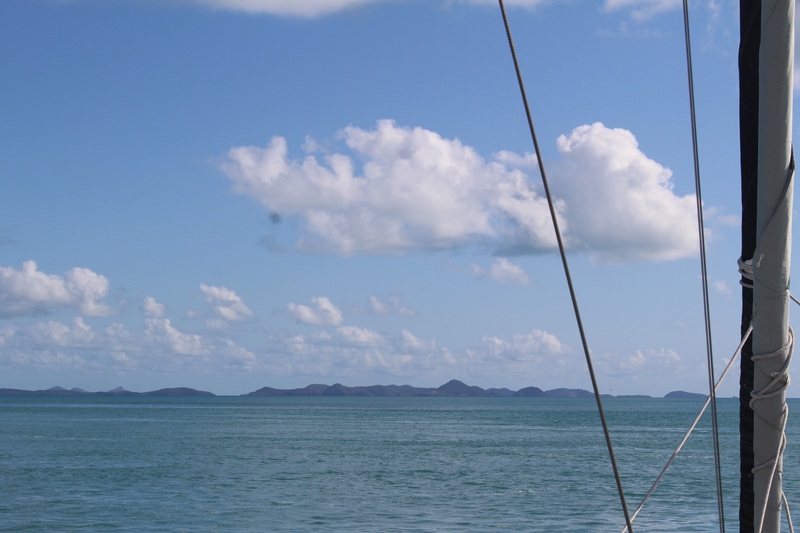 We decided to carry on to Hayman Island, where we again found all moorings taken, and deep water. With sunset approaching we turned back toward a little sandy islet we had passed, expecting to try anchoring there (despite the deep water). But as we approached, in company with Chapter Two and Tahawus, we found three empty moorings! The three crews had dinner aboard C2, to celebrate Mirko’s twelfth birthday. The sailing among the islands today was beautiful. 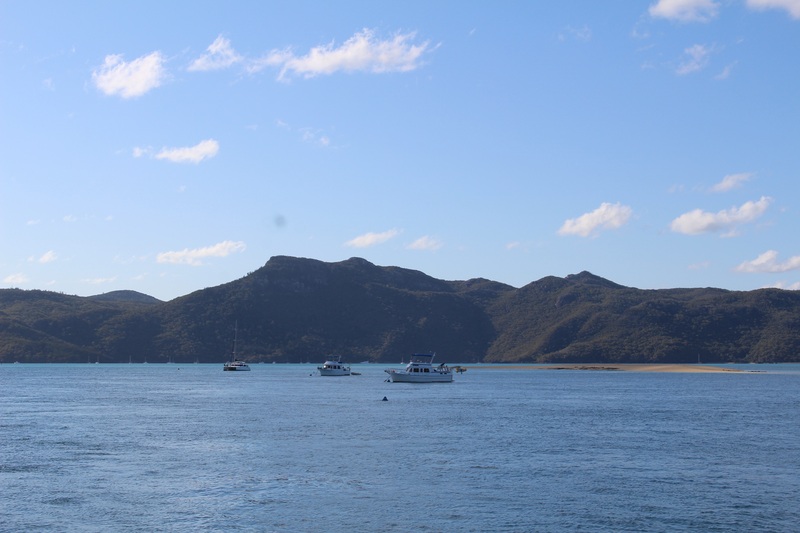 But the crowded anchorages are unpleasant, and I think we all want to move on past the overly popular Whitsundays. I think/hope that further north there will be more “space.” We may do an overnight tomorrow to make some distance, since we have a lot of miles between us and Thursday Island (where we depart Oz for Indonesia in 11 days). 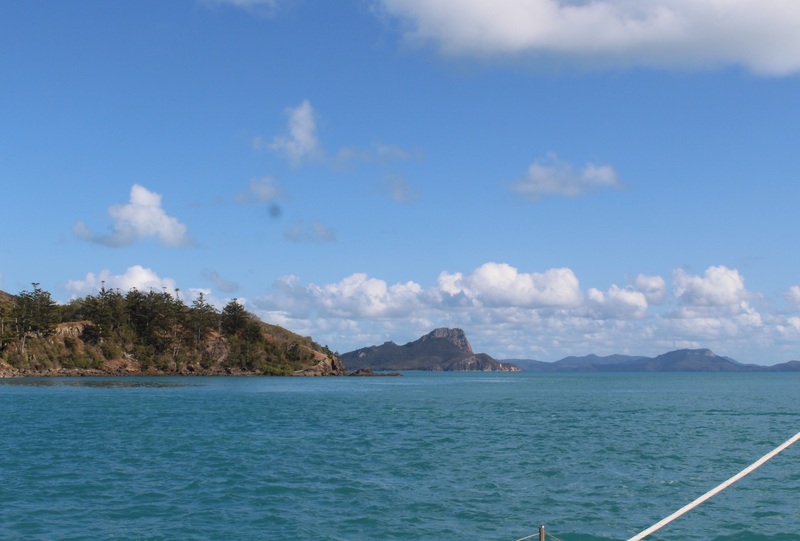 Wednesday — We did an overnight to Magnetic Island. Again, the coast and the island are beautiful. But it was jarring to go ashore here and discover that it is a resort spot with greasy food, and lots of pasty people in skimpy bathing suits, jet skis, and rock music. A little too much civilization for me right now. Jesse and I went ashore a second time in the evening, and had a pleasant meal, but there wasn’t any interesting night life. It all seems to be families with young children on holiday. I received an email from the Indonesian consulate saying that Tim’s passport is in the mail. So we are thinking we will hurry on to Cairns (where it is addressed to the marina) — an early start in the morning and another overnight to get there. Thursday Night — On our way to Cairns on a beautiful night. We sailed past some islands that it would have been nice to explore, but we are on a tight schedule, so we only get to look from a distance. We sailed in company with Maggie for most of the day, before the wind shifted, letting us fly our screecher and pull away from them. Now Tahawus is nine miles ahead and we are closing with them. Many ships tonight, as we are sailing right along the edge of the inside-the-Great-Barrier-Reef shipping lane. Also passed a 758 foot long military vessel at anchor, the HMAS Canberra. Jesse took the first watch tonight, and I’m doing second. The previous night sail we did the reverse. I think going first worked better for Jesse. Probably it is a lot easier for him to stay up than to wake up. And it was fun for me to do the middle of the night watch, which I haven’t done for a long time. 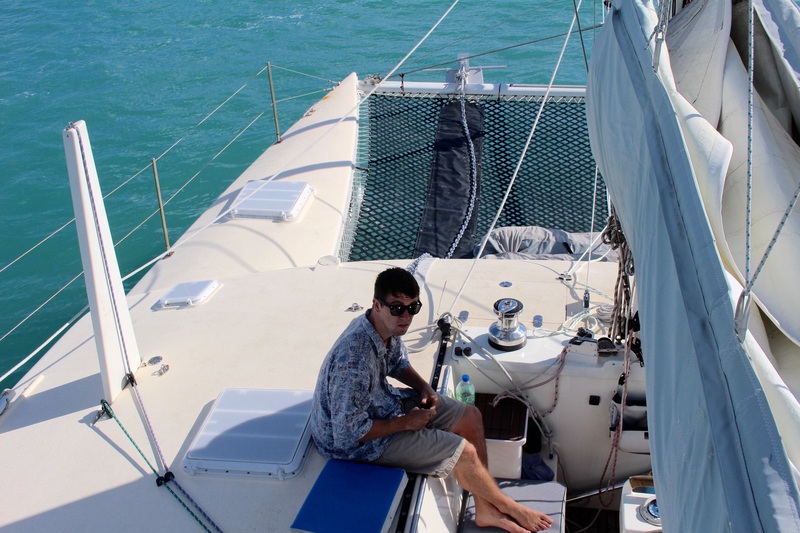 Jesse has been having a hard time getting in synch with life underway — not seasick but very low energy. I’m glad we have this inside-the-reef stretch, where hopefully he adjusts before we head for open ocean. It’s very nice sailing here! Friday — Arrived off Cairns in the morning, started our engines to motor into the marina, and found that we had no control of the shift or throttle! One engine was stuck in gear at moderate RPMs, so we could motor but with limited control. I disconnected the shift cable to the other engine from our MicroCommander control box, so we could shift by climbing into the engine room and manually pushing the lever. And I tied a line to the throttle lever so we could pull it for more throttle. With this rig we motored into the harbor against 30 knot winds, but we weren’t about to try docking in the marina with this handicap. We managed to pick up someone’s mooring and hang there while we called ashore to try to find help, and did our own troubleshooting. The latter led to finding the loose wire connection that was the problem. All working again, we docked in the marina. Trying to back into a slip in the stiff wind, we scraped the adjacent boat, which cost us a few hundred dollars. In retrospect, we should have radioed the marina and said that under the conditions our assigned slip was untenable, and had them assign another. Oh well. Cairns is a Japanese tourist destination. Zillions of people posing for cameras or attached to selfie-sticks. Dozens (maybe hundreds) of restaurants. Many giant boats that load up in the morning and carry their hundreds of tourists out to the reefs, and bring them back in the evening. And constant helicopter flights taking people out for the aerial view. The helipad was very close to our dock, as was the bar with the loud/lousy music at night. It was fun, though expensive, to be in such a place for two days. That was enough for me. 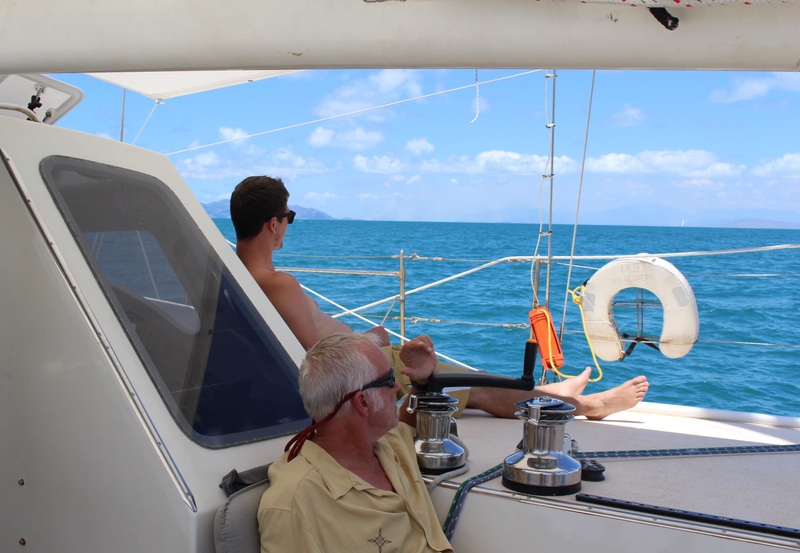 Sunday — Winds still blowing hard, and the others waited another day in Cairns, but we want to spend a day at Lizard Island on our way north, so we went. The sailing wasn’t bad, but rough enough that Jesse got sick. I guess we prescribe stronger medicine when we leave Lizard. Monday — Arrived at Lizard Island in the early morning; everyone tired due to Tim and me standing 6 hour watches, on top of the usual drain from sailing in 30 knot winds. But after a nap we all went snorkeling. It was fun but not impressive. Then after another rest Jesse and I hiked to the top of Cook Mountain, over 1000 feet high. Captain Cook climbed the same route in 1770 to try to spot a route out through the reefs. There was a box at the top with a book for us pilgrims to sign, which Jesse did. 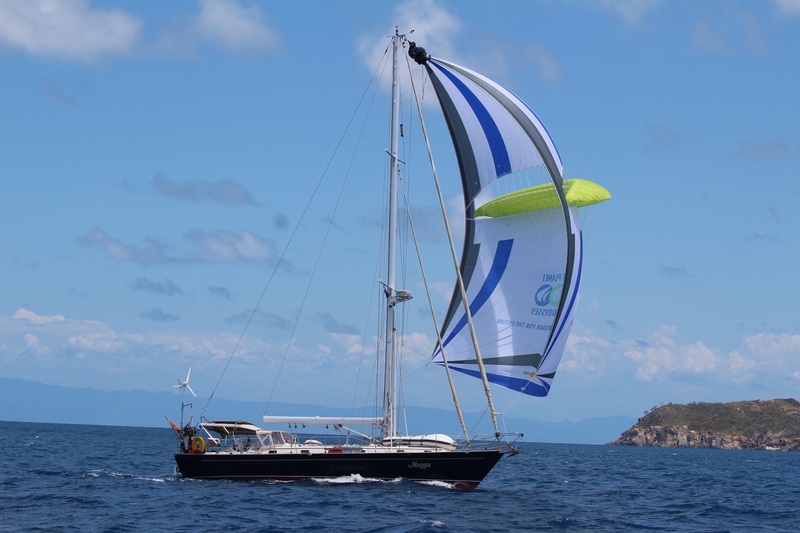 Tuesday — A spectacular day of sailing, zooming along at high speed with our small spinnaker. The wind was 20 – 25 for most of the day, but in the evening it hit 30 and we decided the spinnaker should come down for the night. Now doing a mere 7 knots instead of 10 surfing to 14+. Very smooth water, relatively speaking, since we are inside the GBR and close to the reefs. Jesse has been using a Scopalamine patch, and has been feeling much better. 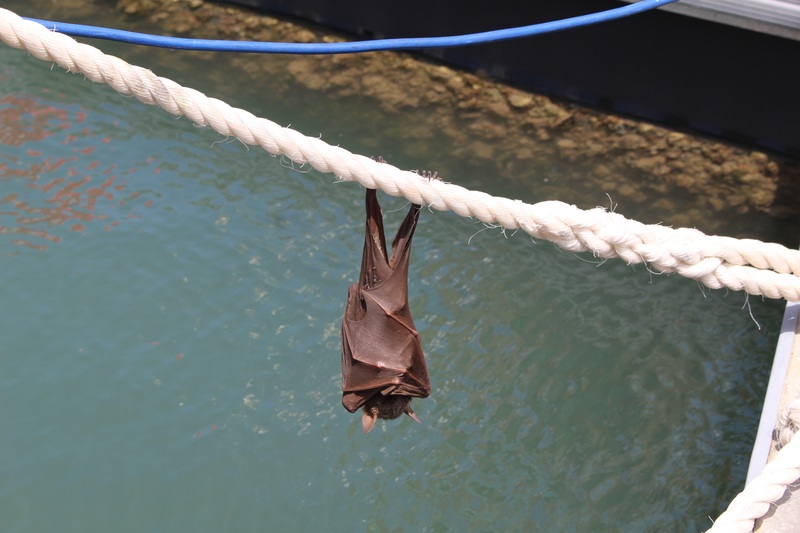 Thursday — Arrived this morning at…Thursday Island. 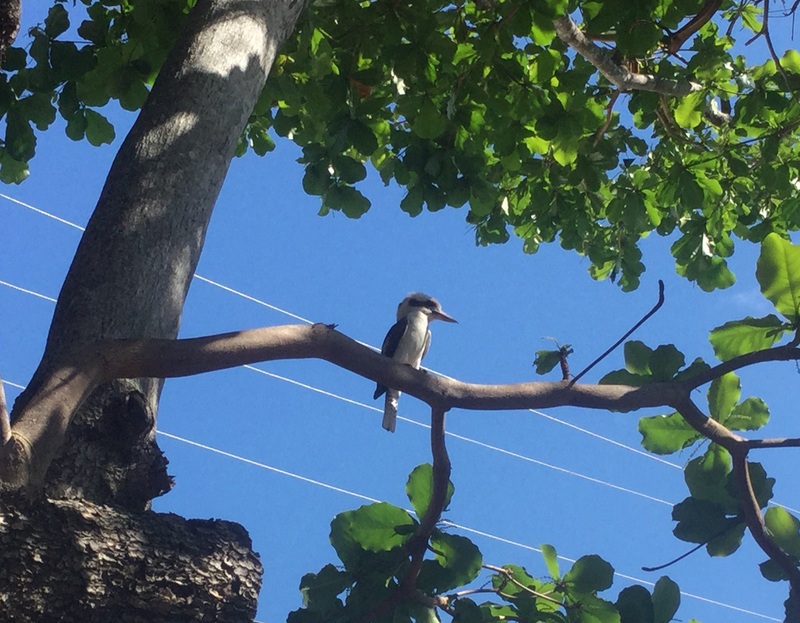 This is in the Torres Strait at the very northern tip of Australia. North of here is Papua New Guinea. East of here is the Pacific; west of here you are heading into the Indian Ocean. This geography makes it an exciting place for me. I remember 30 years ago standing atop Gibraltar looking across at Africa and at the ships passing into and out of the Mediterranean. I felt the pulse of that pressure point of our planet — control Gibraltar and you control the Mediterranean Sea and the civilizations around it! Here at the Torres Strait it is not so dramatic, but for me it brings up the same feeling of being at one of the earth’s powerful places. The wind is howling. Our anchorage is actually in the lee of Horn Island; we took a ferry across to “TI”. We went to the Border Force office with the intention of scoping out what we needed to do to clear out from Australia, and several forms later we were cleared. They say they may stop by the boat tomorrow for an inspection (of what I’m not certain), but we already have our clearance paper and passports stamped. I love your posts! Keep them coming! This is not an original idea, but i think you have the makings of a book, Zeke-r. Hugs to you and Jesse!